For Swiss stamps, the period from 1856 to 1862 witnessed the final issues of the Imperforate Sitting Helvetia or Strubel designs. With the exception of the 2 Rappen denomination, the Bern III Printings on thick paper are quite abundant and relatively inexpensive. Along with multiple shades and relatively abundant postal history, these final Strubel issues provide many opportunities to general collectors, as well as to specialists. The thin paper Strubel stamps issued in 1856 are somewhat of a mystery. Their features more resemble the early Bern II Printings than the coarse looking Bern III Printings. The majority of these stamps also have grid cancels which had been replaced by circular date stamp postmarks sometime near the end of 1855. Unfortunately, these thin paper special printings are very scarce today, and authenticated examples can be very expensive. Paper: Thin Munich paper (0.055 - 0.074 mm). Printing: Frame lines variable. Fair embossing. Cancellations: Grid or town cancellations. 05 Rp. (1856 - ZU #22F, Mi #13IIBzm, Sc #32) - Pale Gray Brown. 10 Rp. (1856 - ZU #23F, Mi #14IIBzm, Sc #32A) - Blue. 15 Rp. (1856 - ZU #24F, Mi #15IIBzm, Sc #33) - Pale Dull Rose. 20 Rp. (1856 - ZU #25F, Mi #16IIBzm, Sc #34) - Pale Dull Orange. The Swiss stamps of the Bern III Printings are all shown above. The 2 Rp. denomination stamp was issued in 1862, to pay the newspaper rate. However, shortly after that, the perforated Sitting Helvetia Issues appeared, and there was no longer any use of the imperforate 2 Rp. denomination stamp. Used examples are very scarce, and many of the used ones on the market today have fake cancels. Paper: Thick Zurich paper (0.09 - 0.11 mm). Plates: Plates of 50 positions. Misaligned arrangement. Narrow spacing (0.1 - 0.7 mm). Printing: Rough impressions. Frame lines not uniform. Little or no embossing. Moderate to heavy color accumulations around Helvetia. Silk Threads: Green silk threads. 02 Rp. (1862 - Bern III - ZU #21G, Mi #19, Sc #35) - Gray. 05 Rp. (1857 - Bern III - ZU #22G, Mi #13IIBym, Sc #36) - Brown. 10 Rp. (1859 - Bern III - ZU #23G, Mi #14IIBym, Sc #37) - Blue. 15 Rp. (1860 - Bern III - ZU #24G, Mi #15IIBym, Sc #38) - Rose. 20 Rp. (1857 - Bern III - ZU #25G, Mi #16IIBym, Sc #39) - Yellow Orange. 40 Rp. (1860 - Bern III - ZU #26G, Mi #17IIBym, Sc #40) - Green. 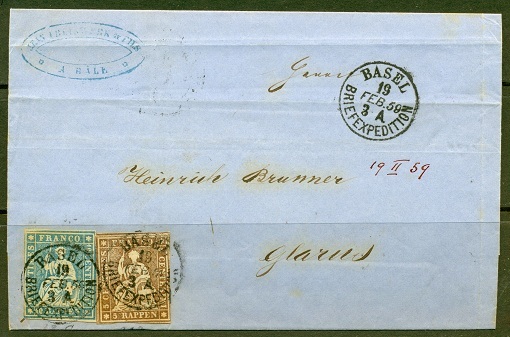 The two scans, directly above, feature a 19 Feb 1859 Folded Letter from Basel to Glarus, with Zumstein #22D & #23C (Bern II Printings). 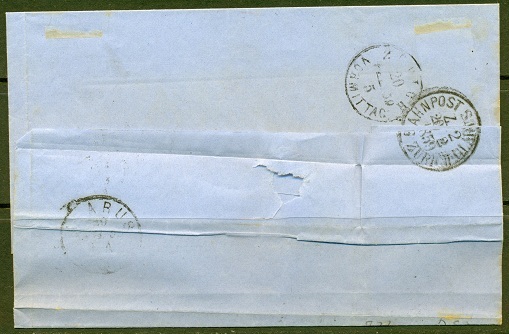 On the back of the cover is a 20 Feb 1859 transit marking and a Railroad Station cancel. Smaller format Swiss stamps, perforated 11 3/4 and printed on two different paper types, were issued between 1862 and 1881, utilizing the same central design as the Strubels. They will be the subject of a separate web page category.